SAM can look after your building, your structure, your process plant. Not who! What! SAM is our Structural Asset Management service – and it’s for all structures, old and new. Not the best choice, but if you need a structural audit report we’d be happy to do it for you. Regular inspections start with the first one, after all! Structures need looking after. Regular means every 6 months, every year, or even every 3 years. It depends on the duty and the environment. Book a re-inspection before we start your first inspection and get a 20% discount on the second and subsequent inspections. Imagine never having to worry about a structure again. We have your models, drawings, and documentation, and you access them anytime from our cloud server. We monitor your structure utilising “Digital Twin” technology and regular inspections, and ensure it always performs as-new and in compliance with codes throughout its life. You don’t have to look too far to discover numerous structural failures, and they’re not just caused by earthquakes and other natural disasters. Much more commonly, structures fail due to a lack of care and maintenance. Whilst machines that move are cared for under a maintenance program, structures that just sit there are more commonly neglected. Take the recent case at a North West Australian mine where a thickener bridge collapsed due to corroded steelwork, killing a worker. It can happen. It does happen. And it can be prevented. Steel corrodes over time, and this corrosion is accelerated a number of ways. Basically, the quicker moist air can get at bare steel, the quicker the process of corrosion. 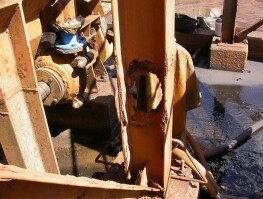 Corrosion leads to a loss of steel, reducing its strength. If strength is lost at a “critical section”, a member can become overloaded and potentially fail. This leads to other members taking more load than they can handle, and can subsequently lead to collapse. A conveyor trestle is struck by a loader. A conveyor gallery is hit by a truck tray, lowered too late. A windstorm whips objects into the air and into building facades, creating unexpected openings. There are several reasons structures can become damaged, and then their strength, their load-carrying capacity, is reduced. We design structures to withstand loads that are not expected to be seen during the design life of a structure. If a chute can get blocked, even if unlikely, we design for that possibility. But sometimes, unimaginable things happen. A common sight is the installation of heavy items on a platform that has not been designed specifically for that equipment. For example, an eye-wash tank on a platform is typically about 4 times the design load! Buildup of spillage on platforms adjacent to conveyors, crushers and screens quickly amounts to more than the allowable walkway load (250 kg/m2 is only about 100 mm of dirt). Buildup of dust on control room and substation roofs, and cable ladders quickly amount to more than the allowable non-trafficable load (25 kg/m2 is only about 10 mm of dust). If a design office is engaged to prepare the design, documentation and construction management of a new process plant, and all that is within it, why is it that modifications are carried out in some cases during the operation phase of the project, without any engineering consultation? It doesn’t make sense! The design engineer knows the capacity of the structure and how it may need to be modified to suit the new requirements, and as soon as this process is broken, the drawings and the design calculations become worthless. And there’s an undefined risk lurking in the plant site. Modified structures need to comply with codes and standards applicable at the time of the modification. Not just the modifications, the whole structure. Dare I say it – there’s a lot of crappy structural engineering “out there”. Thankfully, there’s a decent margin between actual loads and design loads, and between design loads and structural failure. During the “mining boom”, we suffered a shortage of good structural engineers, and projects were rushed quickly out of the design offices and into construction. One of our clients discovered design and construction issues during commissioning that led to immediate failure of several large ore bins. The cause of the failure was a combination of inadequate design, poor drawings, construction not in accordance with the design intent, and inferior welding. But what about those structures that don’t immediately fail? They’re sitting somewhere beyond the safe zone and somewhere before structural failure. A strong wind, or a combination of any of the above – corrosion, modification, damage, overloading – could be enough to cause structural failure and potentially, catastrophic collapse. What style of structural asset management does your company have?